Active Start Course: Completion of a training course totaling 3 hours (Active Start Stage of Development – players U-4/U-6). No pre-requisites required. FUNdamentals Course: Completion of the training course totaling 7 hours (Fundamentals Stage of Development – Boys U-6/U-9 and Girls U-6/U-8). No pre-requisites required. Learn to Train Course: Completion of the training course totaling 14 hours plus take NCCP Make Ethical Decisions Module (Learning to Train Stage of Development – Boys U-9/U-12 and Girls U-8/U-11). No pre-requisites required. Soccer for Life Course: Completion of a training course totaling 14 hours, plus take NCCP Make Ethical Decisions Module (Soccer for Life Stage of Development – Boys U-13 and Girls U-12 and older). No pre-requisites required. Note: coaches do not undergo an official evaluation process in the Community Sport Stream, therefore they are not designated on their NCCP transcript as a Certified Coach. These courses provide training only in developmental stage specific areas of coaching. With this in mind coaches taking part in these courses will receive the status of Trained Coach(or will be considered In Training if they have still to complete a module of the particular course they have taken). Soccer Nova Scotia are pleased to announce an initiative to assist with the progression, development and enjoyment of the game at all levels. 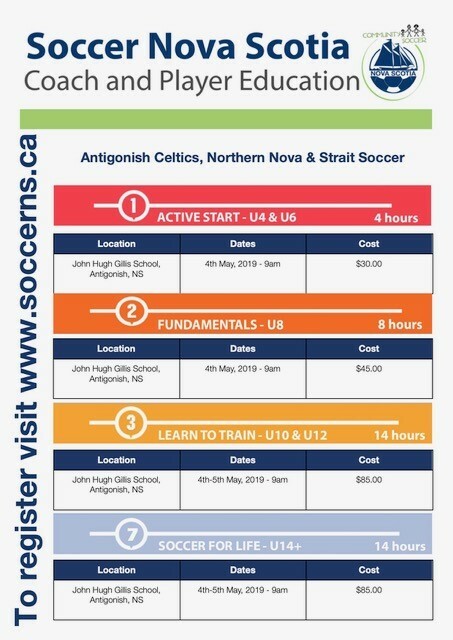 The initiative is to promote and support clubs that all players receive a trained coach in all programs offered by Soccer Nova Scotia registered clubs. If you are someone that wishes to become more involved in the sport of soccer as a coach but are uncertain of which certification you need, click on the following link and complete a short 5 question questionnaire that will go some way towards answering your initial questions.